Back pain: Don’t let the MRI scare you. Next Step Physio > Musculoskeletal > Back pain: Don’t let the MRI scare you. Have you ever been a little frustrated with a doctor or physio who reads your spinal MRI/CT report in 10 seconds and doesn’t appear to acknowledge the detail in the report? This is because when it comes to back pain, MRI/CT scans are only really useful to exclude nasty “red flags” such as tumours or spinal malformations. Often seeking a diagnosis for a condition can help you to understand it better and validate your experience of the symptoms. Sometimes, however, it can overwhelm you. Thinking about the diagnosis triggers you to think about the symptoms, so the symptoms endure longer than they would if you were never informed of the diagnosis. This is more often the case with back pain. 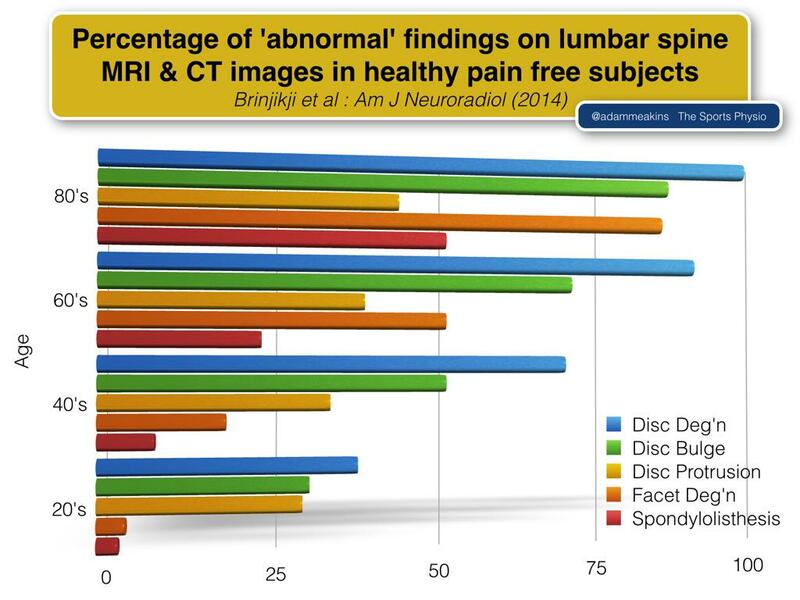 This graph summarises the lumbar spine CT/MRI findings of 3110 people who were HEALTHY and PAIN FREE. Looking at the youngest age group, over 30% of people in their 20s have disc bulges identified on MRI or CT scans, and over 35% have disc degeneration. They are even more common in the older people. Not one of those people had back pain. So if you are pain free, you could have disc bulges or disc degeneration and you wouldn’t even know it. Therefore it holds true that if or when you develop back pain, and you have a MRI or CT scan, there is at least a 30% chance that your scan will identify disc degeneration or disc bulge. It is intuitive to jump to the conclusion that the disc abnormalities on the scan explain your pain, and then you research a little further and you realise that disc degeneration cannot be reversed and disc bulges don’t improve much in size. The evidence is clear; degenerative changes and disc bulges are present in high proportions of asymptomatic individuals, increasing with age. Many degenerative features are likely part of normal ageing and unassociated with pain. This doesn’t mean your pain is all in your head. It means that the findings on the MRI/CT scan don’t necessarily explain your pain. Your symptoms explain your pain. The best approach is to treat the symptoms, not the scans.